'Extinction features, without doubt, the funniest passage in the whole of literature. The dreadful becomes hilarious, joyful - and it makes one thirst for more of the similar.' - Geoff Dyer Franz-Josef Murau is the intellectual black sheep of a powerful Austrian land-owning family. He now lives in Rome in self-imposed exile, surrounded by a coterie of artistic and intellectual friends. On returning from his sister's wedding on the family estate of Wolfsegg, having resolved never to go home again, Murau receives a telegram informing him of the death of his parents and brother in a car crash. Not only must he now go back, he must do so as the master of Wolfsegg: and he must decide its fate. 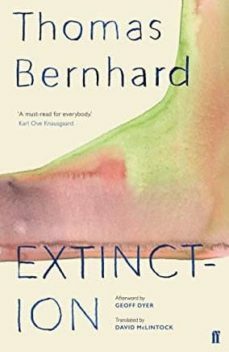 The summit of Thomas Bernhard's artistic genius - mesmerising, addictive, explosively tragicomic - Extinction is a landmark of post-war literature.